Linguistics Research Digest: Text or call? How one thing leads to another….. Text or call? How one thing leads to another….. The use of mobile phones allows us to exploit communication through both written (text messages) and spoken (phone calls) language. Whether we choose one mode over another depends on many factors. For example, research has shown that teenagers often choose text messages over phone calls because they are cheaper and faster than making a call and because they are more convenient in that they can take place anywhere and at any time. On the other hand, teenagers seem to prefer a phone call if the call is to their parents and usually only call their friends if they need to explain something or if they have a lot to say. Researcher Ditte Laursen has been at the forefront of research on adolescents’ mobile phone communication and in this recent article she reports not on the choice of mode but rather on the change of mode, specifically how participants manage the change of mode from a text message to a phone call and how both modes interrelate as parts of the same communication sequence. 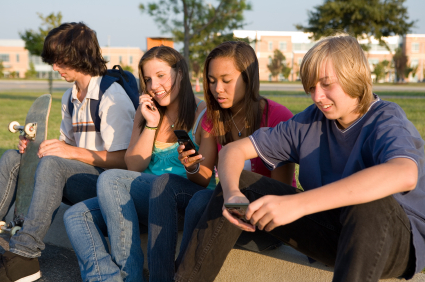 The data come from the recordings of mobile communication (text messages and mobile phone calls) of six 14-year-old friends who were recorded over a period of six weeks, one week for each person. Laursen focused on a subsample of mobile communication, which involved 31 young people and consisted of 481 text messages and 173 calls. She found that the messages and calls were often linked to other messages and calls. For example, she found that 100 of the 173 calls were parts of series of calls and that 24 of the calls were preceded by a text message. For example, a girl sends a text message to her best friend to say that her boyfriend has let her down. Rather than reply with a text message, the best friend calls the girl. Laursen suggests that in this context the call demonstrates a greater commitment than the text message and is used to ‘upgrade the importance or the seriousness of the text message’. These calls, which can be seen as a second pair-part in a paired sequence, also allow for a longer and more complex response than a text message. The opening sequence in this type of call is said to be minimal since the participants do not need to introduce themselves or make any initial enquiries (such as how are you? where are you?). When a text message is sent and requires a reply which does not subsequently arrive, a reminder for a response may be made in the form of a call. Laursen provides an example of a young person who sends a text message asking another person to meet her the following day to repay some borrowed money. The person does not respond to the message nor arrives the next day with the money so the sender makes a phone call which then requires an immediate response. In these conversations the opening sequence is likely to be maximal (self-identification, greetings, initial enquiries). In this way, the caller puts off the reason for the call and provides the callee with the opportunity to respond to the unanswered text message (thus avoiding possible conflict). In these cases, there has been a closed text exchange but it is then followed up by a call which addresses the text message exchange. An example might be when an arrangement to meet has been agreed via text messaging but then one person calls the other close to the time of the appointment perhaps to confirm the meeting. Laursen suggests that the phone call provides an opportunity to confirm the meeting place and time in an interactive way and that it gives the conversation ‘an air of urgency’ as the call is made at the time of, or shortly before, the meeting time. 4) the confirmation (after a text message with a request for/promise of a call). These are calls which result from text messages that contain a request or a promise of a later call, for example calls which follow a text message which contains the request call me or a text message which contains the promise I’ll ring you later. These calls are usually made because the exchange is likely to be complex and will require multiple turns back and forth. Text messaging in such cases might be deemed as inappropriate. The study is innovative in that it is the first study of text messages and mobile calls in interconnected communication sequences. Laursen argues that text messages and mobile calls are often intertwined to such an extent that they are not meaningful if considered separately or taken out of sequence. Her analysis indicates that phone calls following text messages are often used for complex or lengthy matters and that they might be considered ‘more valuable than a text message’ when the call is used to deal with important topics or when used to express emotional aspects of an interaction such as compassion and sympathy. Laursen, Ditte (2012). Sequential organization of text messages and mobile phone calls in interconnected communication sequences. Discourse and Communication 6(1): 83-99.